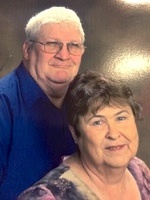 Larry Ray Snyder, 76, of Spring Hill, KS, passed away June 28, 2016 at Olathe Medical Center. Private Family Memorial Service at Bruce Funeral Home, Spring Hill, KS (913) 856-7111. Memorial contributions may be made to Am. Cancer Society. Larry was born April 15, 1940 in Ellinwood, KS to Ellis and Marie (Senko) Snyder. He grew up in Ellinwood and attended Ellinwood High School Class of 1958. He later moved to California and finally settled in Miami County. Larry married Doreen Flanders April 5, 1959 in Great Bend, KS. He owned and operated Signal Hill Truck and Auto in CA and owned a Dairy Queen in Independence, MO. Larry was an entrepreneur who enjoyed fishing, building, photography, gardening, racing slot cars, barbequing and smoking meat. He was a “fix-it-man” who also built race cars and motors. He developed fishing tackle and held a patent for its design. Larry will be missed by family and friends. He was preceded in death by his parents; brother, Robert Snyder and sister, Chloe White. Larry is survived by his wife, Doreen, of the home; daughter, Dena Ballew and husband Ken, Spring Hill, KS; sons, Lynn Snyder and wife Chris, Cincinnati, OH, Chad Snyder and wife Rachelle, Olathe, KS and Travis Snyder and wife Jill, Olathe, KS; eight grandchildren, ten great-grandchildren and one great-great grandchild; siblings: Russell Snyder, Pleasanton, CA, Colleen Krom, Ellinwood, KS, Louann Stokley, Hutchinson, KS and Karen Melcher, Pratt, KS.